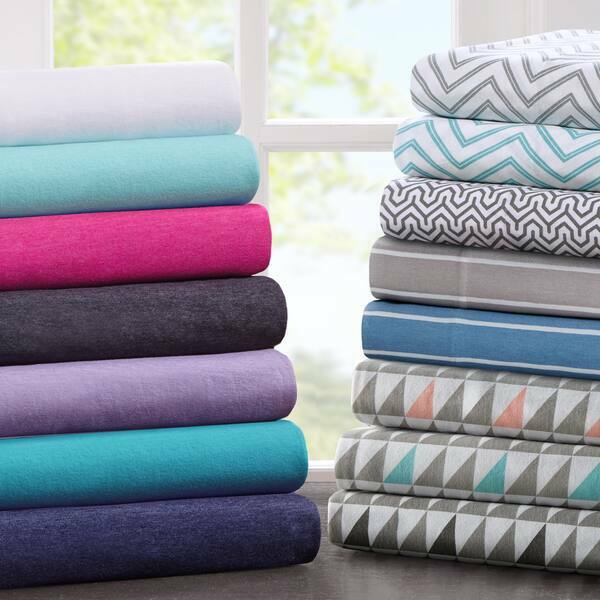 These sheets are true to the Jersey Knit Name! The softness and color are perfect...even after being washed! Luv them! Contrast a simple, solid-color bedspread with the playful prints of the Denver jersey knit sheet set from Porch & Den. Also available in solid colors, the loose, stretchy knit of these sheets brings a cool comfort on hot summer nights. I've always loved jersey knit sheets, they are soft and comfortable...but on the flip side they are pretty cheap and the materials is see through. Like them so much, I've ordered anothe set. As soon as I received these sheets, I washed them, then put them on my bed. They fit very well over my mattress and my memory foam topper. They feel very soft and are extremely comfortable to sleep on. Since I started using the jersey knit sheets, I use nothing else. I wish I could give a full review of these sheets. Overstock keeps sending out the wrong sheets!!! I am getting single brushed cheap microfiber sheets in the same colors of the Clay Alder Jersey sheets I ordered!!! I’d hold off on purchasing these sheets until Overstock fixes the obvious coding problem in their factory! Now I am waiting for Overstock to locate the correct sheets to send out. I must also add Overstock has not been very apologetic & has not offered any kind of compensation for the hastle and long time I am waiting to get what I have ordered and paid for. Not too impressed with their customer service! If I actually get my Clay Alder Jersey sheets I will adapt this review to reflect the quality of the sheets. I ordered 2 sets. Love these sheets and the printed geometric one! Well made and feels comfortably soft. My teenagers are particular about the feel and colors. These passed their test with flying colors! Wish there were more unisex colors and prints available! Love the color and softness of these sheets! Purchased these sheets for my son's dorm room. He only likes SOFT sheets and these are definitely soft. Washed & dried them before packing them up for college and they came out of the dryer even softer, but still sturdy. I've purchased some jersey knit sheets that get very thin after a wash or two, but these feel like they will hold up well. I purchased the striped ones, and the stripes run straight from the top of the sheet to the bottom, unlike some others I have purchased where the patten runs crooked. I feel like I received good quality merchandise for a decent price. Such comfortable and stretchy sheets. Material pills after only a few washes. Love these. Finally found a sheet that stays on my adjustable bed. Awesome sheet set. I gave this five stars because the sheets are very good quality and as expected. Sheets are very soft and made of very good quality material. I love the quality of this sheet and the fact that I do have to struggle with the wrinkles. I like the softness of jersey knit but these sheets seemed to pill and that was frustrating. I ONLY buy sheet sets with patterns. So much easier when putting on the fitted sheet, and these lived up to that expectation. Nice and soft too, nice colors. These are t-shirt like sheets and they are a decent price. I do have an issue with the stains that came with them? I'll post pics and let people decide for themselves. I actually stopped taking pics after the 4 or 5th one but there were a few more spots. There was a weird spot on one of the sheets. Hopefully the spots come out. Didn’t last long. Not the highest of quality. Love these sheets, have ordered them for multiple beds in my house. "Is the Jersey Knit 100% cotton? or does it have some synthetic material as well?" No, I just received the sheets and very disappointed they are 50% polyester. Only 50% cotton. "Looking for the weight on these. How many ounces per square yard? " "How many sheets and pillow cases do you receive? " The twin had one flat sheet, one fitted sheet, one pillow case. The full size had one flat sheet, one fitted sheet, two pillow cases. I purchased a queen set and received a flat and fitted sheet and two pillowcases. Hope that helps! 2 pillow cases, a flat sheet and a fitted sheet. Very soft! "How do you order extra pillowcases for these sheets? I'm interested in the twin sheets but it only comes with one pillowcase. Do you sell pillowcases seperately as well? " We do not offer the pillowcase sold separately at this time. "What is the thread count on this sheet set?" I sent these directly to my son, so I have no idea. I'm sorry. They are knitted fabric like a tee shirt, so no thread count. I love jersey sheets, but the reason I bought these particular ones is that they come in pink. It is hard to find queen size jersey sheets in pink. Although, I would have preffered a lighter pink. "Hi, why am I not seeing the multi floral queen set offered? Are u out of those? Not saying it is.. Lori"